← What’s your view on HS2? 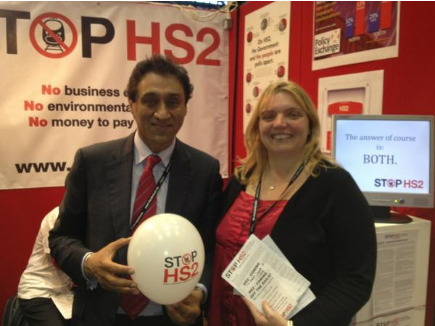 The anti-HS2 campaign is having stands at all 3 main party conferences. Thanks go to Hillingdon residents for their donations that have helped with this important element of the campaign. Well what a few days we had at the Labour conference and I was only there for half of it. Before we went I was nervous thinking people from Birmingham and beyond would be pro-HS2 and have been fooled into thinking we were selfish nimbys by the vested interests campaign. However, the very opposite was true, virtually everyone we spoke to was suspicious of HS2, it’s costs and it’s benefits. Of course there were some very pro HS2 but they were minimal – one man admitted he “loves trains”. Another man from Surrey was pro but after reading the leaflets he actually came back to say he accepted we made some good points and was at least a bit won over. Some from further afield said it was not affecting them so they weren’t interested. So that person from Plymouth for example, who said that, is possibly misguided, as the South West has major issues with transport links and employment and of course everyone in Plymouth will be funding HS2 through their taxes and most will get no benefit whatsoever. Grass roots Labour members generally do not appear to support HS2, they don’t want cuts to other services and they have no appetite for such an expensive vanity project. The slick suits and shadow cabinet might support it but maybe that is because they are out of touch and paid to support policy such as HS2. The most interested people were councillors from around the country who are having to carry out cuts right now, and wanted to know how HS2 may affect their area. We had hot off the press FOI information on possible cuts to other services and they were delighted to be taken seriously and be given real and relevant information for them in West Lancashire, Bury, North Manchester, Doncaster, Derby, Merseyside, Wakefield and many more. A Doncaster councillor promised me he would show Doncaster MP Ed Miliband the information. We had lots of other info on jobs/growth/capacity/the environment etc. etc. to share too. A variety of people from Kent came over to share their experiences of living with HS1 with us. On the first day we were busy manning the stand and giving out leaflets outside to tell people about HS2 and our fringe event with impressive speakers Christian Wolmar and Frank Dobson MP. Outside we had Harriet Harman, Jack Straw, David Miliband and Chuka Umunna take Stop HS2 leaflets, and had a brief chat with Maria Eagle and Andy Burnham. We also spoke to David Miliband again later in the day but he said he thinks HS2 is going under his house so he won’t talk about it. We spoke to BBC’s Nick Robinson encouraging him to our fringe event – he said he was a Manchester lad so more in favour of HS2. We said “so you think it’s good enough for Manchester to wait 20 years to become the new Birmingham?” He really laughed. 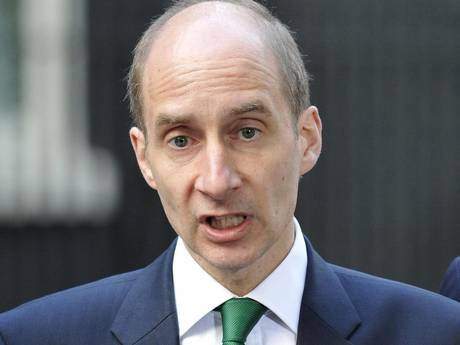 A few other journalists including Evan Davis told us they already knew about HS2, so that is great, as if you know about it, you can only know it has issues. The Evening Standard and Central ITV news also came to say Hi. Various politicians visited us, from the local constituency delegate for Uxbridge and South Ruislip, to Val Shawcross and Onkar Sahota from the GLA. Various councillors (though no local or Ealing Labour councillors got in touch), unionists and shadow defence secretary Jim Murphy among many others. We also had interesting chats with Lord Berkeley of the Rail Freight Group and Baroness Valentine of London First. So what about the pro HS2 figures? 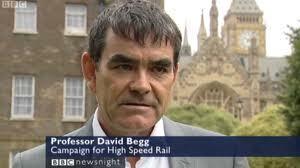 2 of who are – Lord Adonis, the proponent of HS2, and Professor David Begg, who is involved with the Campaign for High Speed Rail. I decided to go to Fringe Events to see them and hear them for myself. Adonis – an un-elected politician who was previously a Liberal Democrat and came up with HS2 apparently in a vacuum, was speaking at a Progress event. He is president of Progress (a Labour think-tank) so was enjoying himself being hero worshipped and applauded. He did a speech about politics for the many – which is ironic when his flagship project is likely to be used by the rich 1%. At the reception I approached him and asked him the question most local people would probably like to ask: what in his heart is the driving force for him to keep pushing HS2? Of course he has no idea who I am or possibly where Hillingdon is, so he talked passionately about the case for it, and missed the sarcasm in my tone. In summary – his one burning argument is capacity. That the West Coast Mainline will be full and upgrades won’t work. The green issue is subjective he said or something along those lines. I thanked him for his time and off I went. The next day he passed our stall and I offered him our capacity leaflet which counters his arguments nicely. He recognised me and said he had realised I had an agenda. He took the leaflet, and wondered off saying, you have a good position for your stall. Then that evening he went to a Fabian society fringe event where the topic under discussion was involving communities in policy making and so on. Randomly Adonis expressed concerns to the audience that Stop HS2 had been allowed into conference at all and that we had such a well-placed stand. It was actually a humble stand! So much for Labour being open to engaging communities! Funnily Deanne, AGAHST director was present and was able to raise a question, but good lord – is the top of the Labour party really that petty! If HS2 was robust they could take any debate, instead of spitting out dummies and labelling campaigners as nimbys, and trying to stop us from being visible. David Begg was chairing a debate on aviation. He runs Transport Times, is involved in the Campaign for High Speed Rail, is a non-executive director of BAA Heathrow and something to do with First Group. During the meeting there was input from Heathrow, Hounslow, Luton, Stanstead, Gatwick and the Estuary where Boris Island is proposed to go. There was much discussion about the future of aviation in the South East. I put my hand up to ask a question about how if their concerns were right why is the government planning to build an expensive spur to Heathrow, and skewing the HS2 route west, without knowing their aviation strategy. Begg looked at me, and said exactly what I was going to say, without letting me speak. Which is possibly because he did not want to give me a platform or allow me to speak on behalf of Stop HS2 (assuming he had any idea who I was of course). Or maybe it was what was on his mind at that point, as it was a natural concern. This shows just how bonkers the current plans are – if someone involved in the campaign for High Speed Rail is saying that in front of so many. By then I had to leave – lots more happened since then for the others, including Ed Miliband having the Stop HS2 literature and our old friend the Stop HS2 white elephant Ellie visiting and of course the interest in the West Coast Main Line fiasco. And I leave you with this thought – maybe next year! This entry was posted in Uncategorized and tagged Adonis, Begg, Eagle, Labour, Miliband, Onkar Sahota, Val Shawcross. Bookmark the permalink.